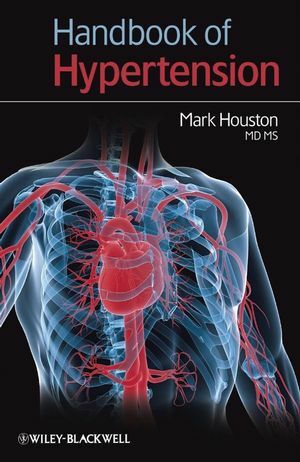 The Handbook of Hypertension is a comprehensive review of the evidence base for hypertension and associated disease, providing tables, figures, charts, and summaries of principal findings from clinical studies on hypertension – putting vital information within reach of the busy practitioner. Hypothesis: Essential Hypertension and End-Organ Damage. Hypertension Classification and Guidelines Wordwide. Indirect measurement of blood pressure. Common Mistakes in Blood Pressure Measurement. Nutraceuticals, Vitamins, Minerals and Antioxidants. DASH I and II Trials. Approaches to Selection of Antihypertensive Therapy. Renin Profiling: The Laragh Method. Hemodynamics: Logical and Preferred Method to Reduce Blood Pressure. Hemodynamic Effects of Antihypertensive Drugs. Life Expectancy and Blood Pressure. Systolic, Diastolic and Pulse Pressure Concepts. Clinical Hypertension Trials and Antihypertensive . Completed Trials and Trials in Progress. Summary of Clinical Trials with Diuretics. Summary of Clinical Trials with Beta-Blockers. Meta-Analysis of Various Clinical Trials. Comparisons of ACE-Inhibitor therapy with Placebo. Comparisons of Calcium-antagonist therapy with Placebo. Comparisons of More Intensive Blood Pressure Lowering Strategies with Less. Comparisons of Ace-Inhibitor based Therapy with Diuretic-based or Beta-Blocker Therapy. Comparisons of Calcium-antagonist-based Therapy with Diuretic or Beta-BlockerTherapy. Comparisons of Ace-Inhibitor Therapy with Calcium-antagonist Therapy. Summary of Clinical Trials in Hypertension and Clinical Outcomes. Comparing the CCBs to other Antihypertensive Therapy. Summary of Published Trials Involving CCBs. Angiotensin Converting Enzyme Inhibitors (ACEI) Trials. Angiotensin Receptor Blockers (ARBs) Trials. Coronary Heart Disease Risk Factor and Effects of Anti-hypertensive Drug Therapy. Coronary Heart Disease: Risk Factors. Coronary Heart Disease Risk Factors: More potential risk factors. Influence of Diuretic and Beta-Blocker Therapy on CHD Risk Factors. Antihypertensive Drugs and Serum Lipids. Summary of Serum Lipids and Antihypertensive Therapy with Diuretics and. Effects of Antihypertensive Drugs on Coronary Heart Disease Risk Factors. Antihypertensive Drugs and Coronary Heart Disease Risk Factors: Summary. Calcium Channel Blockers and Atherosclerosis (CHD Reduction Trials). Classification of Chronic Kidney Disease. Is Thiazide Diuretic-Based Antihypertensive Therapy Associated with Increased. Major Clinical Trials Showing Renoprotection. Effects of Antihypertensive Drugs on Renal Function. Hypertensive Diabetics: Mortality, Coronary Heart Disease and Antihypertensive. BP Level Effects on Type II-DM Nephropathy. Diabetes Mellitus and Hypertension Summary. Selection of Therapy Based on Subsets of Hypertension. Isolated Systolic Hypertension in the Elderly. Treatment of Specific Hypertensive Disorders. General Review of Antihypertensive Drug Therapy. Quality of Life and Antihypertensive Therapy (Selected Trials). Total Cost of Antihypertensive Therapy. Characteristics of the Ideal Antihypertensive Drug. Combination Antihypertensive Therapy: Selected Drugs. Combination Antihypertensive Therapy: Selected Drugs: Summary. Antihypertensive Therapy: Efficacy of Monotherapy. Selected Drug Interactions with Antihypertensive Therapy. Maximum Recommended Doses of Antihypertensive Drugs with Best Treatment Characteristics. Specific Review of all Antihypertensive Drug Classes. Comparison of Commonly Used Oral Central Alpha-Agonists. Side Effects and Contraindications of Beta-Blockers. Non Hypertensive Treatment Effects of ACEIs. Treatment: Non Hypertensive Effects of CCBs. Ang-II Receptor Blockers (ARBs): Highlights. Non Hypertensive Treatment effects of ARB’s. Serum Aldosterone Receptor Antagonists (SARA’s). Combination of Anti-hypertensive Drug with Statin ( Amlodipine with Atorvastatin). Subset Selection of Antihypertensive Therapy.